Steve and I got high with 12 of our friends last week, then we all visited the most top-of-the-line hangar in town and drove to lunch at ArrowCreek because we were starving. Okay, that may be one of the best titles I have ever used for an article! I bet it got you to read at least these first couple of sentences. Well, here’s what actually happened. Steve and I took 12 people on a tour of the Reno air traffic control tower, where we had a stunning view of the city, but that is as “high” as we got. Our control tower tour got us high enough to see the whole city. I have to thank my friend Joe Rajacic for the opportunity to host this small event. We would have invited more of our friends and investors, but only 12 guests are permitted at a time. 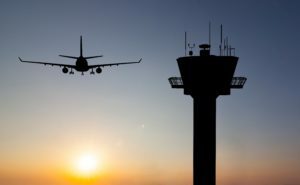 If this is something you would like to do in the future, let us know; the next time we put together an air traffic control tower tour, we can add you to the list. The morning started with one of the Federal Aviation Administration (FAA) managers showing us a PowerPoint presentation on drones. It was very interesting to see how the FAA is having to deal with drones and the various rules that drones have to abide by. Drones can’t be flown higher than 100 feet within a 5-mile radius of the airport. Beyond 5 miles, they can fly up to 400 feet. And while it’s possible to fly drones at higher altitudes, you need permission from the FAA. Next, we were treated to a really nifty visual simulation demonstrating actual flight patterns — takeoffs and landings — during some recent mornings. We learned that Reno has about 200 flights per day, while Las Vegas can handle one flight every 60 seconds. Then, 6 at a time, we went up the elevator plus two more flights of stairs to get into the traffic control area, where there were 4 people in a large room. They were not sitting at computer terminals as you might imagine, but they were walking around directing traffic. It wasn’t busy while we were in the tower, so there wasn’t a lot of action, but the view of the airport and the Sierra Mountains with all their snow was nothing short of spectacular. I find airplanes to be a wonder. I mean, how do you get a 970,000-pound, fully-loaded 747 to fly through the air, seemingly weightless? That part is amazing, but the #1 reason I have always loved airplanes is because of what they represent: freedom. Airplanes give us the freedom to do exactly what we want, when we want, and how we want. There may be nothing more fun than seeing the world from above, and, for me, it puts things into perspective. I remember reading in the Sam Walton biography that when he first started to find locations for Walmarts, he would fly over the city he was interested in to find the best one. Let me briefly switch gears to talk about Joe Rajacic, my buddy who made this tour possible. He’s a retired 747 captain who flies private jets for Reno Flying, and he owns Advanced Aviation Training. At AAT, students can train on flight simulators with over 150 different types of aircraft to choose from, including drones. They also offer a program to help people overcome their fear of flying. By using the simulator themselves, uneasy flyers gain a better understanding of how planes work, bringing them a greater sense of trust and comfort. If that wasn’t enough, Joe also started the ALEX program (Aerospace Learning Experience) here in town to teach and motivate our youth who have an interest in flying. His program ties into local schools’ STEM programs. We’re planning a Hughes Capital invitation-only event at Advanced Aviation Training, where we will all get to fly the simulators and the drones. We might have a little contest to see who can land the plane the best. After we finished our tour of the air traffic control tower, we headed over to the Atlantic hangar, which holds up to 20 planes at any given time — from single prop planes to multimillion-dollar jets. I hope to visit again someday, but with my own airplane to take off in. Ah, freedom.